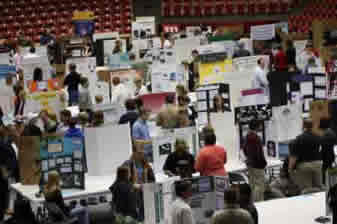 The annual Southern Utah Science and Engineering Fair is open to science projects from students in grades 5-12. Projects can be performed by a single student or a team of up to three students. Projects with teams of students will be judged versus those of other team projects. August 28, 2018 Hello, Science and Engineering Fair partners! Welcome back to another fair season. We are currently working behind the scenes to update both our webpage and our registration page. In addition, we will be sending out an informational letter to teachers in a couple of weeks. But, please note the date of this year's science fair in on a THURSDAY. This will reduce conflicts with other events on the SUU campus, and will hopefully reduce conflicts with athletic and other extracurricular high school events. There are no major rule changes for this year and registration fees will remain the same. We look forward to working with you over the next few months. Happy researching! September 21, 2017 Welcome back to another year of Scienc Fair! We are actively working to update both our website and registration site. Registration should go live in a few days. In the meantime, registration costs will remain the same for 2018, and there have been no major rule changes from the International Science & Engineering Fair. Please reach out if you have questions or concerns. You can reach us at susef@suu.edu. We look forward to working with you all again this year! October 11, 2016 The new science fair season is well underway. I've had conversations with some of our teachers and know that many students are already working on their projects. We have high expectations this year, as last year one of our ISEF finalists was a category winner at the international fair. The registration website is up and running. If your projects need Scientific Review Committee approval get those applications submitted soon. January 29, 2016 So registration is in full swing. Please note that in order to avoid the late fee, registrations are due by February 5th. This is to ensure that our Scientific Review Committee has ample time to review each of the project, in accordance with ISEF rules, and allow students time to make up any deficiencies. If you have any questions or concerns please email us at susef@suu.edu. August 26, 2015 Welcome back to a new year of science fair! We hope you and your students are already beginning to think about great projects to engage in this year. We had a great 2015 season! Our ISEF finalists represented our region very well at the International Science and Engineering Fair in Pittsburgh. The International Fair in 2016 will be held May 8-16 in Phoenix, Arizona. In other news, we have contracted with a software company to use a new piece of software for handling all of our registration needs. Although the site is not yet up, please look for this in mid-September. In the meantime, if you have questions about science fair, please contact us at susef@suu.edu. February 25, 2015 The date of SUSEF is quickly approaching. We hope our participants are finishing up any last minute details. An updated campus map (showing locations of all SUSEF events) and a schedule for the day are both accessible using the links above. Our Scientific Review Committee is quickly working through all of the applications to ensure adherence to rules. Any violations, as well as missing forms, payments, etc., will be communicated to the individual schools very soon. In the meantime, please don't hesitate to reach out (susef@suu.edu) if we can answer any questions or deal with any concerns. We look forward to seeing you in just a few weeks!